My name is Rudy Sheptock, and I am on Twitter as @RudyOrangeAndBlue. I am a full time Minister and a part-time DJ! My daily midday Radio Show is called Rudy On The Radio and it’s heard Monday-Friday from Noon until 2PM on LIFT FM here in Cape May County, NJ. I have been married 36 years and have four kids and four grandkids. I love social media and enjoy the many friendships I have made via Twitter and Facebook. I became a die hard Mets Fan in the mid 1960s because of my Dad. He grew up a Brooklyn Dodgers Fan, and when they and the Giants left for California, there was no way my Father was going to root for the Yankees. So when the Mets came along, he began to root for them and passed his love of the Orange and Blue on to me! Because I never do anything halfway – I was in for life! My first Mets Autograph was Gil Hodges, but my first hero was Tom Seaver. I patterned everything I did after Tom. I would listen to the Mets on the Radio and would be perfectly in-sync with Seaver even though I could not see the game. I wore either 14 or 41 all thru my playing days. I also taught both my sons the drop and drive style of Seaver’s pitching. I have tons of Seaver memorabilia all over my house! I cried the day they traded him to the Reds! Stupid! Stupid! Stupid! While my oldest Son was born in 1986 and that magical season, nothing will ever compare to the Summer of 1969! After so much losing, the Mets were finally winning! And I loved Gil Hodges and the innocence of that era for me cause I was 10 years old! Seaver’s almost perfect game! I was at Banner Day that August when the Mets swept the Padres 3-2 in both games. The double-header that the Mets won against the Pirates where both games were 1-0 with Jerry Koosman and Don Cardwell driving in the runs! Ken Boswell singling in Cleon Jones against the Expos to put us in first place! And the day we won the World Series! I was in Baseball Heaven! I am so glad I was alive and well because that Team was my Team! Cleon and Tommie Agee! Jerry Grote and Donn Clendenon! I remember riding my bike thru the old neighborhood screaming We Won The World Series! Childhood at it’s best! Even the Mets on the Ed Sullivan Show! Real Mets Fans are a unique breed! We are never confident. We always expect the worst and are pleasantly pleased when our Team comes through. We despise the Yankees! We love Bob Murphy. We miss Shea Stadium! The chant of Let’s Go Mets still gives us Goosebumps and we can still hear Jane Jarvis play the organ in our souls! We love Wilmer Flores and can’t understand why the Wilpons are still around! We can call our Mets Bums but will defend them to the death! We bleed blue and orange! Love to hear Put it in the Books and will always stick around for the Happy Recap! I was a Mets Fan at 7 years old and now at almost 60- I still love them! I’m “the Uni Watch guy.” I write about uniform and logo design for ESPN and on my own website, Uni Watch. I was born into a Mets family. One of the earliest life lessons I can remember getting from my big brother was that we rooted for the Mets and hated the Yankees. And thus has it ever been! I attended my first game — a 7-6 win over the Astros — in 1971 and still have the ticket stub to prove it. When I first started rooting for the Mets, I somehow decided that I loved Tommie Agee. Not really sure why. Was also very fond of Jon Matlack during that period. Later became a huge Keith Hernandezfan. And always loved Ed Kranepool and thought they should have retired his number just because he played every season dating back to 1962. These days, I really like Jacob deGrom. The Buckner game, of course. We all know we deserve better than the Wilpons, but the situation is what it is. Hang in there — we were in the World Series just a few years ago, so the pendulum can swing our way again. The 441 foot shot was the longest in Citi Field history and first into the Promemade Level. It was shades of Tommie Agee. The Mets looked like a different team after that. Travis d’Arnaud got it started with a one out single off Cubs starter John Lackey. Then a minor miracle happened when Alejandro De Aza worked out a walk against Cubs reliever Joel Peralta. Then Brandon Nimmo had the at bat of the night. Nimmo was quickly down 1-2 in the count. He would foul off three straight pitches, and he would hit an RBI single on the ninth pitch of the at bat. It narrowed the score to 3-2. He alertly moved to second when center fielder Albert Amora tried to get De Aza at third. Joe Maddon then went to Pedro Strop to pitch to Neil Walker. Strop quickly went ahead in the count 0-2, and the Cubs pulled the infield in. Walker then hit a hooper at second baseman Baez who had no shot at getting De Aza at home. 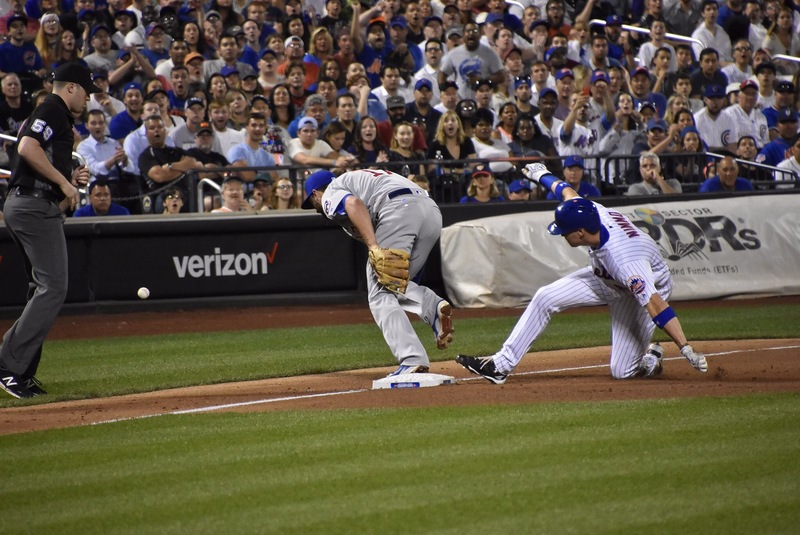 He tried to get Nimmo at third, but he threw it wild. Nimmo then scored to make it 4-3. It was a comeback the likes of which the Mets have not made in quite a while. In the eighth, MLB history was made when Addison Reed pitched to Addison Russell. Russell won the first ever battle of the Addisons by walking. It set up runners at first and second with two outs. Maddon sent up Jason Heyward to pinch hit, and Terry Collins countered with Jerry Blevins. Blevins got Heyward to tap one back to Blevins to end the inning. Jeurys Familia recorded his 27th straight save this year to secure the 4-3 win. This one wasn’t easy. Ben Zobrist hit a double to make it second a third with no outs. Familia struck out Bryant, and then intentionally walked Anthony Rizzo to face rookie catcher Willson Contreras. Familia struck out the overmatched Contreras. Baez popped it up to end what was a tremendous save by Familia and win for the Mets. The Mets took the first game of a four game set against the Cubs. By the way, last year’s NLCS was also a four game set. Game Notes: Matz showed his frustration out there a few times, most notably when Lackey buzzed him on a sac bunt attempt. He also threw his glove after the Baez homer. Erik Goeddel earned the win after pitching 1.2 scoreless innings.